Jaipur Development Authority has come up with a new residential plot scheme 2017 at JDA Dev Vihar Yojana for the allotment of housing units. 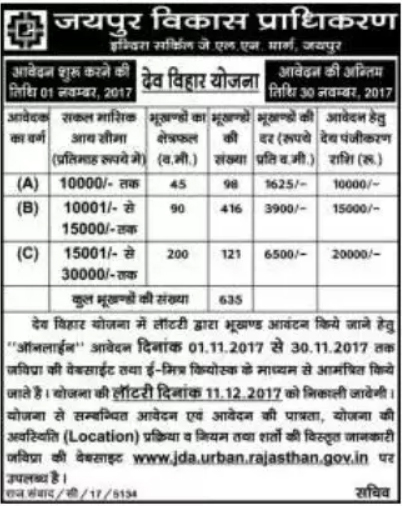 Advertisement for booking and online registration of JDA Dev Vihar Yojana new plot scheme 2017 has been released through which applications are being invited from general public through www.jda.urban.rajasthan.gov.in	from today and last date of submitting the JDA Dev Vihar Yojana application form is 30 November 2017. Under JDA new housing scheme 2017, total 635 residential plots are available for booking which are categorised into three categories Category-A, Category-B and Category-C having a size of 45 square meter, 60 square meter and 200 square meter respectively. The process of online registration for residential plots in JDA new housing scheme 2017 at Dev Vihar Yojana has been started and the last date of application submission is 30 November 2017. Application form can be submitting through the official website of JDA, jda.urban.rajasthan.gov.in or through E-Mitra KISOK Jaipur. Interested applicants can fill the online application form through JDA official website, jda.urban.rajasthan.gov.in and E-Mitra KISOK service of Rajasthan government. The direct link to apply online has been activated on the web portal and registration process is available here. To apply for this housing scheme of JDA, the interested one should fall under the eligibility. The age of applicant should be 18 years. The applicants should not have any house/plot/flat allotted by Jaipur Development Authority or any other government authority under any government housing scheme. Monthly income of applicants belonging to Category-A should be less than Rs. 10,000/-. Monthly income of Category-B applicants should be in between Rs. 10,001/- to Rs. 15,000/-. Monthly income of Category-C applicants should be in between Rs. 15,001/- to Rs. 20,000/-. After receiving applications, list of eligible and non-eligible applicants will be released by the authority and a lottery programme will be conducted for all the eligible applicants on 11 December 2017 in which lottery draw result along with winner list will be released. More information of the new plot scheme will be available at the official website from tomorrow.